Experts and students of the ancient sacred music from across the globe have gathered for what is billed as “the most in-depth teaching conference ... on sacred music in the world.” They’re honing their musical skills and bringing the solemn choral notes to several St. Paul churches. The centuries-old chants were tossed out of most Catholic churches after the Latin mass was put in deep storage in the 1960s. That was a mistake, say members of the Church Music Association of America, and a lot of people now recognize it. “There’s been an explosion of sacred music workshops across the country,” said Janet Gorbitz, manager of the association, which brought 250 musicians to the University of St. Thomas for a five-day colloquium ending Saturday. But the growth isn’t just among Catholic worship leaders. The public increasingly is captivated by the celestial sounds they hear in popular film, in concert halls, even in their doctors’ offices. Case in point: A Gregorian chant album by a Nebraska religious order, the Priestly Fraternity of St. Peter, has been one of the top three bestselling classical albums on Amazon since it was released in May. While the Church Music Association’s focus is on Gregorian and polyphonic chants in the religious setting, its members are pleased that the music is entering popular culture. It’s a “door” that they hope people will walk through to explore its religious roots and meaning. “It piques people’s curiosity,” said Mary Demko, music director at Transfiguration Catholic Church in Oakdale. 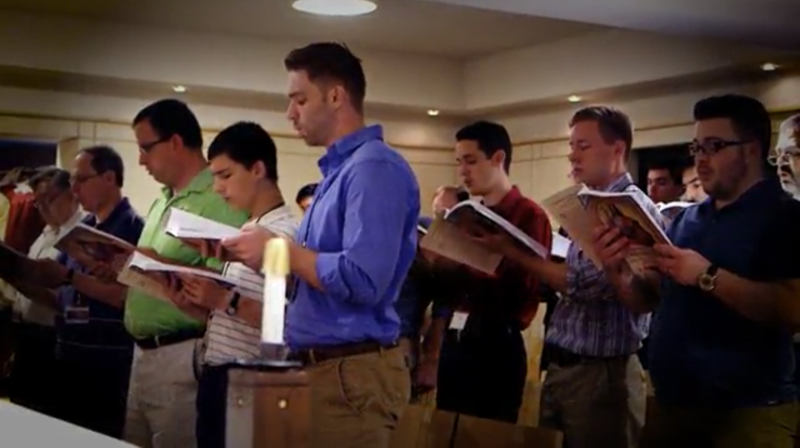 Transfiguration is among Twin Cities churches reviving the ancient hymns. The Rev. Bill Baer urged the shift several years ago, said Demko, who began training both the adult choir and the children’s choir. The children now say that their two favorite pieces are chants, she said. Like other choir directors, Demko acknowledges there is some resistance. So the choirs started slow, singing the chants now available in English and only at the beginning of mass and during communion. The city of St. Paul holds a special place in the hearts of the leaders of this organization, said Gorbitz. The late Rev. Richard Schuler, of St. Agnes Church in St. Paul, was the former president of the Church Music Association and a lifelong believer that the exquisite sacred music should never be forgotten. After the Second Vatican Council in the 1960s, when the traditional Latin mass was abandoned in favor of a liturgy in the language of the people in the pews, many Catholics believed chants were no longer welcome, Gorbitz said. However, Catholic musical leaders such as Schuler kept the torch lit, even as most churches switched to guitar masses, folk masses, and even polka and mariachi services. That “taste” is being developed across the metro area. Gregorian chants can now be heard in some form at the Cathedral of St. Paul, St. Augustine Church in South St. Paul, St. Raphael’s in Crystal, the Church of All Saints in Minneapolis — to name a few, said a group of Minnesotans gathered for the colloquium lunch Thursday. Cindy Holupchinski, music director at St. Mark’s Catholic Church in St. Paul, said she hadn’t considered introducing Gregorian chants until she attended a Church Music Association colloquium about 10 years ago. Learning about historic chants “was a kind of conversion,” she said. Slowly and delicately, she began introducing the ethereal hymns to her choirs. Today the church incorporates chanting at two of its four services.